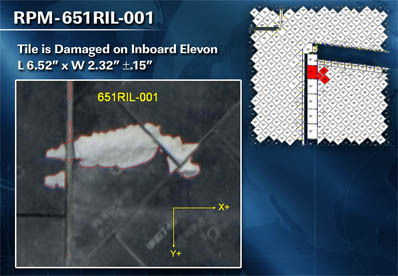 KENNEDY SPACE CENTER, FL--Close-up photos of heat shield tiles on the shuttle Endeavour's belly taken during final approach to the International Space Station Wednesday revealed several gouges and dings from apparent debris impacts during launch. LeRoy Cain, chairman of NASA's Mission Management Team, said three "areas of interest" may require an additional focused inspection Saturday to collect more data. "This is not cause for alarm, it's not cause for any concern," he said. "We know how to deal with these things in terms of how to assess them. We know that if we get to the point where we need some more data for our assessment, we have a plan for going and doing that." Cain showed reporters a chart listing seven damage sites on the belly of the shuttle, all of them on the right side of the spacecraft starting at the right main landing gear door and running in a rough line back to the right-side inboard elevon, or wing flap. 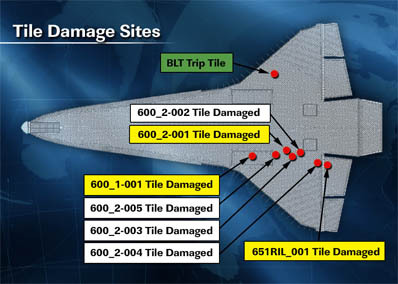 Three of those seven damage sites were shown in yellow, indicating engineers have not yet been able to fully characterize the potential threat and what, if anything, might need to be done. "These are three areas that are an example of some areas where the team wants to do some more work, some more assessment," Cain said. "At this point, what we have said is we don't have any reason for concern or alarm. "As you know, we have a focused inspection placeholder in the timeline. ... We've asked the ops team to go to the next level of preparation in terms of ensuring we don't do anything to preclude being able to do that focussed inspection if, in fact, the team comes back and says our analytical techniques were not able to clear one or more of these sites." The damage was spotted after commander Mark Kelly guided Endeavour through a back-flip maneuver to expose the underside of the shuttle to cameras on board the International Space Station before docking. The belly of the shuttle experiences extreme heating during re-entry, second only to the ship's reinforced carbon carbon nose cap and wing leading edge panels. 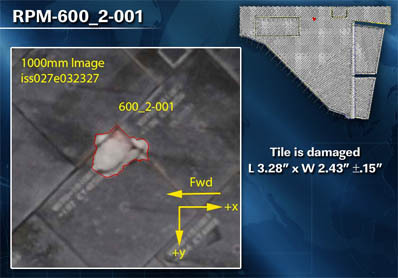 In a procedure that has become routine in the wake of the 2003 Columbia disaster -- a mishap triggered by damage to a wing leading edge panel -- astronauts Paolo Nespoli and Catherine "Cady" Coleman, working in the Russian Zvezda command module, snapped hundreds of images of Endeavour's belly tiles using 400-mm and 800-mm telephoto lenses as Kelly guided the ship through a 360-degree rotation. As usual, the digital photos were downlinked to the Johnson Space Center for analysis. Nothing obvious could be seen in standard-resolution television views of the rendezvous pitch maneuver that were beamed down from the station in near realtime, but the zoomed-in photos shot by the station astronauts clearly revealed multiple damage sites, including the three highighted by Cain. One, on the right landing gear door, measures 5.9 inches long and 1.23 inches wide. Another ding downstream of the door measures 3.28 inches by 2.43 inches. The third area of interest crosses the hinge line of the right-side inboard elevon, measuring 6.52 inches by 2.32 inches. The question for engineers is how deep the gouges might be, how thick the tiles in question area and what sort of temperatures tiles in those areas experience during re-entry. The shuttle crew's flight plan includes a block of off-duty time Saturday at the beginning of their "day," starting at 12:26 a.m. EDT (GMT-4), that was set aside for such an inspection if needed. Focused inspections have been carried out during four post-Columbia shuttle missions. One of those was STS-118, an August 2007 flight by Endeavour that was commanded by Kelly's twin brother Scott. In that case, engineers concluded a softball-size chunk of foam insulation broke away from a bracket supporting the 17-inch-wide liquid oxygen feel line attached to the outside of the shuttle's external tank during launch. An instant later, the foam slammed into a support strut that helps hold the back end of the shuttle to the tank. The debris broke into several pieces and one ricocheted off the strut and directly into the belly of the shuttle, gouging a pit measuring 3.48 by 2.31 inches across. Engineers eventually concluded no repairs were needed and the astronauts completed a safe re-entry. Tile repair tools were developed in the wake of the Columbia disaster to give shuttle crews a way to fill in potentially dangerous gouges and other types of damage and the astronauts are trained to use them. But NASA managers would not order a repair unless absolutely necessary out of concern additional damage might result that could make matters worse. Cain said he did not want to speculate on what, if anything, might be required for Endeavour. "I am not concerned, myself and the team, we're certainly not alarmed by what we're seeing here," he said. "We undertand the work we need to go do and we're very much in the midst of doing that work." Endeavour made the climb to space using external tank No. 122, a Columbia-era tank that was damaged when high winds from Hurricane Katrina caused part of the roof of its manufacturing cell to collapse at Lockheed Martin's Michoud Assembly Facility in New Orleans. "ET-122 was in one of our production cells down at Michoud when Hurricane Katrina hit and several small chunks of concrete were dislodged from the room and fell on the tank, damaging the foam," shuttle Program Manager John Shannon said before launch. "We kind of put that tank to the side while we were doing normal processing. "I asked the team several years ago to go back and look at ET-122 and see if it was a viable flight tank. All the foam in that area was dissected. The LOX tank, they did eddy current (testing), they did all kinds of non-destructive analysis on it. It was a very good tank, so they replaced that foam, they went to the intertank area, there was one stringer that had been nicked, they took that stringer off, put a new one on, re-foamed that area." The foam insulation on the tank is nearly 10 years old. To make sure it was still up to the rigors of launch, "they did pull tests all over the tank, they did assessments to make sure it's a good tank and safe to fly," Shannon said. "Then they did all of the return-to-flight modifications that we had done on tanks after Columbia." "We have a lot of confidence in ET-122," he said before launch. "It doesn't look real pretty because we did some foam patches, it looks a little more like the hail-damaged tank that we flew, which I think was ET-120. But from all out testing and experience, we have high confidence in that tank." As with all post-Columbia flights, Endeavour's ascent was monitored by batteries of launch pad cameras, radar and long-range trackers, on the lookout for any signs of foam insulation falling from the external tank that could damage the shuttle's fragile heat shield. Debris poses the biggest threat during the first two minutes and 15 seconds of flight when the dense lower atmosphere can cause lightweight insulation to come to a near standstill in a fraction of a second. The accelerating space shuttle can then slam into it at a high relative velocity. A phenomenon known as "cryo pumping" can cause foam to pop off later in ascent when liquefied air trapped under the foam near the top of the liquid hydrogen tank warms and expands as the fuel level drops during the climb to space. But testing and flight experience show cryopumping typically happens well after the aerodynamically sensitive period. Given the history of Endeavour's "hurricane tank," mission managers expected to see more foam insulation falling away during the climb to space than usual because not all of the post-Columbia tank improvements were carried out for the repaired tank. 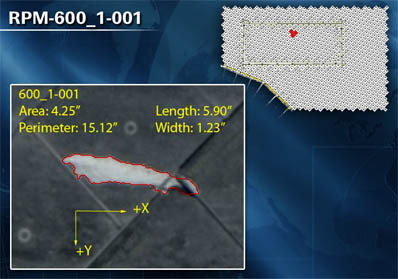 But NASA managers said after launch only a handful of debris events were noted in the ascent imagery. Three of those occurred well outside the aerodynamically sensitive transport time while two others occurred toward the end of the window of vulnerability. All appeared to be relatively minor.